The photos above are just a few of the many photos uploaded in previous years to celebrate driving electric. 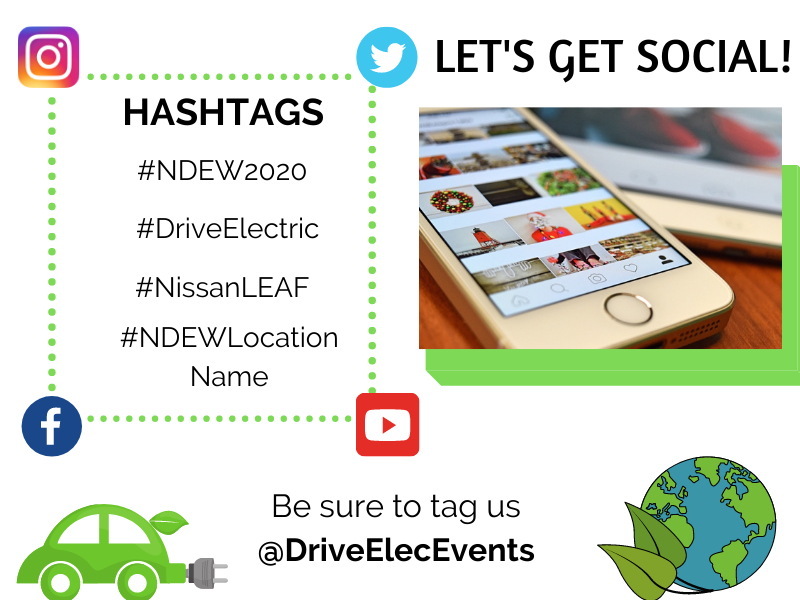 Drive Electric Earth Day 2019 is coming up and it's time to remind everyone about how to share the wealth of photos and videos from this year's event. Promotional messages surrounded by social content, such as likes, shares, and comments from people you know, have a 4X greater recall rate. And with crossposting, hashtagging, geotagging, and photo tagging, it's easy to get hundreds or even thousands of eyeballs on your pics, so a little photo and video sharing goes a long way. There will be photo ops galore on Drive Electric Earth Day, and City Captains will be well armed with smart phones and the Instagram app. Whether or not you are a City Captain, you can get in on the action. Hashtags make it easy for social media users to discover images related to topics of interest. 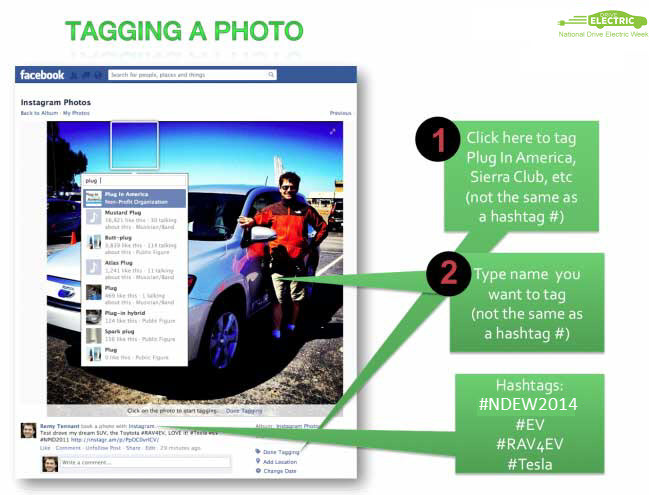 For example, if someone wants to see pictures of the Toyota/Tesla RAV4 EV, they can go to a social network, search for that hashtag "#RAV4EV", and see every picture that has been taken of the RAV4 EV (provided that a hashtag has been added). You can add as many hashtags as you want. It is a good idea to keep them as relevant as possible, but don't be afraid to get creative and try things like #EnergySecurity so that someone interested in that subject might happen upon a picture of an electric car. Hashtags NOW work on Facebook too so use them when posting videos and pictures on Facebook, YouTube, Twitter. You can take a picture or a video directly through the Instagram app or take it with your phone's regular camera and upload it through the Instagram app (there is a dedicated button for this function – familiarize yourself with the app and you will find it). Because the Instagram frame is a square and not a rectangle, it is easier to take the picture with Instagram. If you choose to take it with your phone's regular camera and then upload it afterwords to Instagram, you will need to crop the photo into a square, otherwise you will have black bars at top and bottom and you will give yourself away as a social media amateur. If you do choose to take pictures with your regular camera and upload later, make sure to add the location name to the photos. Now that you've taken your pic with Instagram, it's time to get the most out of this robust app. 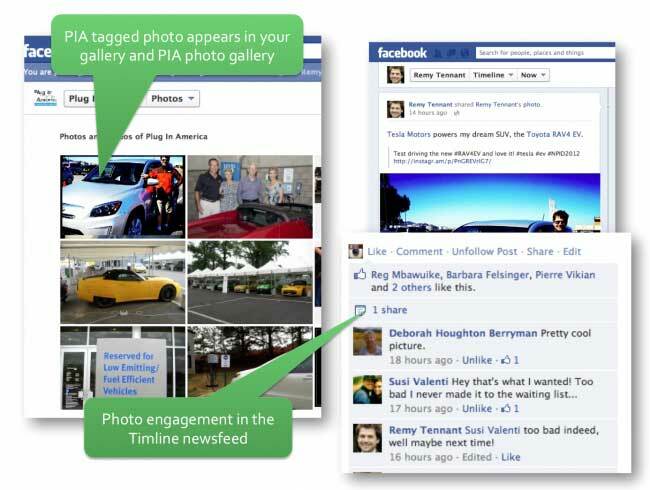 You can tag just about anything on Facebook – people, places, electric cars, and anything else that has a Facebook page. Tagging will help ensure that as many people as possible see your photo. Congratulations, hundreds or even thousands of people are going to see your photos and this officially makes you a share-a-holic. 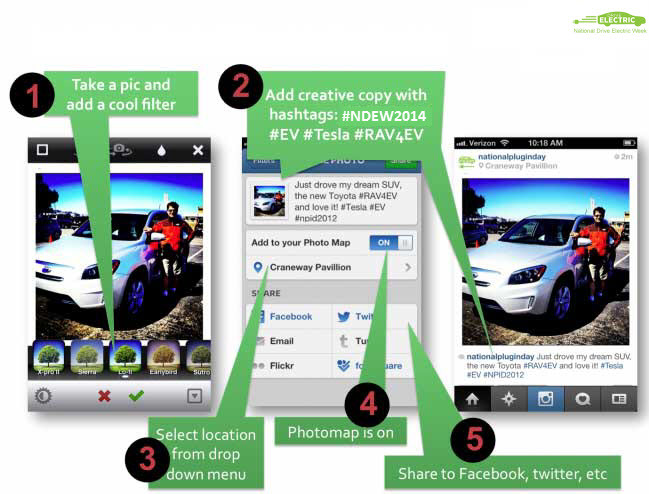 Got more ideas for creative uses of social media for event promotion? Let us know in the comments! 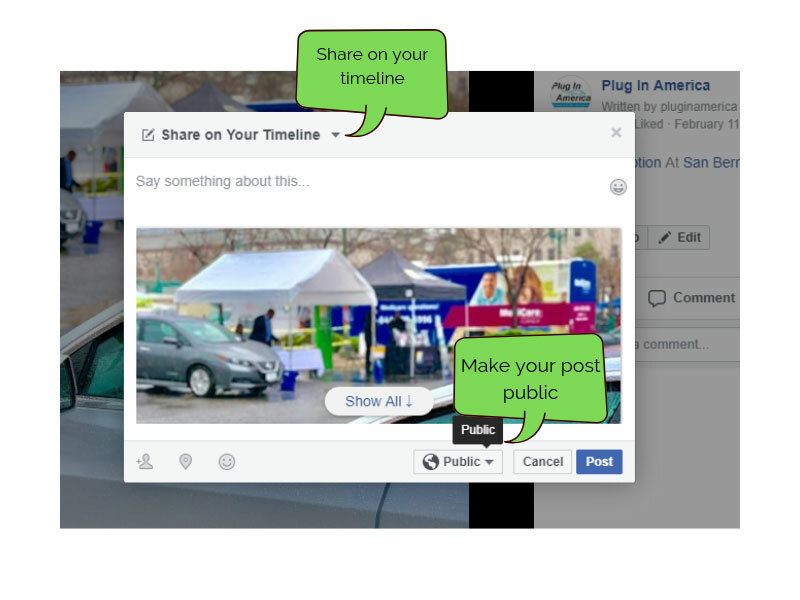 This post was contributed and originally designed in 2012 by Remy Tennett for PlugInAmerica.org here.